Happy Wednesday my little book elves! I really want to get straight on to the review, so not a lot of prefacing today! Though, I do want to say that because I was so excited about posting this review up, I went ahead and decided to skip MY Wednesday Wishlist post today in favor of the review. However, I will still participate in Pen to Paper's "Wishlist Wednesday" below. I picked up this book and read a few pages. Then I put it down. I left it for a long time, and it waited for me patiently. I picked it up again. I read a few more pages. Then I put it down again and left it for a long time. Still, it waited. Finally one day I picked it up and when I began to read I just couldn't stop. It stayed by my side for days, happily keeping me company during break-time and keeping me awake at night. The book had me in its grasp. Finally, at the halfway mark, I couldn't bear the little-by-little anymore and I spent 6 happy hours finishing up the read. I honestly wish I could tell you that I will be able to even begin to give this book the review it deserves. It has been a long...oh so long... time since I have fallen so absolutely head over heels in love with a book. It took me 5 books into the series to love Sookie Stackhouse as devoutly as I do now. Cinder was great and is surely one of my recent favorites, but it didn't rock my world. The last time I remember feeling this strongly about a book was Harry Potter, and you fans out there know what that feeling is like. The tingling in your fingers when you feel the weight of the work in your hands. You flex your toes in anticipation when you open the pages back to your marker (the one you put in when the world got in the way). Other than the necessities, such as breathing, you avoid all other involvement with life just so you can finish the unfathomably spectacular literary journey you've embarked on. Diana is a 30-something witch. We're speaking literally here. The woman is brilliant (it really helps that the AUTHOR is brilliant because the intelligence really translates), of decent good looks, and of a mind set that includes "I am queen over my own life, body, and mind". She's a human-wanna-be. She won't use her magic. Period. She wants a normal life with no magical ties. Why? Because her parents were brutally murdered when she was 7 years old, and she grew knowing that magic was the reason they were taken from her. So she contents herself with the dull routines of life, throwing herself into academics to become a professor of alchemical history. But, oops! Diana is exceptionally powerful, and she's leaking magic. And... another big oops here... she unwittingly calls up a manuscript that hasn't been seen in hundreds of years that is said to hold the key to "creature" creation. Think The Origin of Species for paranormal beings. Now everyone's eyes are on her, including those of a handsome, ancient, vampire named Matthew. Matthew's got a few things going for him (okay, try everything) but he's SOL in love. When he joins the band to meet Diana and find out about the Manuscript he ends up with more than he bargained for in the feelings department. Now they're on a quest to get their hands on the manuscript before anyone else and they've got an army from all sides after them because of their involvement with each other. Apparently Witches and Vampires are never supposed to mix. It's socially taboo. This book is full of history, random/obscure knoweldge about pretty much everything, a fantastic romance, a great moral about love crossing all boundaries, and finally a masterfully developed plot line that keeps you turning the pages. The characters are colorful and tangible. In the nearly 600 pages of this book, the reader will REALLY get to know Diana, Matthew, and the slew of family and friends that gather to stand up for them against the face of an impossible enemy... prejudice. I found myself reading and rereading the paragrahps because there was so much going on in each and every little exchange. Gobs of information is present in pretty much every corner of the story and the exchanges between characters are often so erudite that I have to take a moment to absorb everything being said. That, however, is not a negative to this work. The presentation of all of this information doesn't make the author come off pretentious at all. I get involved in the learning, and the knowing, and the discovering the story through references to historical figures that I had no idea existed. The philosophy and psychology in this book are also phenomenal. "Group Think" is touched upon, along with the concept of ancient laws still governing modern people-groups. This would be such an incredible book for a book-club, especially one that is very discussion oriented because I believe that there's a lot there in the work that can't be drawn out just from reading it to yourself. I wish I had the opportunity to really sit down with another reader and hash out all of the intricacies of this work. It may have vampires and witches in it.... and it may contain a lot of the romance novel aspects... but GEEZ is it a treasure trove of discussion topics! I desperately adore this book and I'm on the waiting list to get the second book in the trilogy, "Shadow of Night", at my local Library. Part history book, paranormal field guide, romance, and mystery this book will appeal to a vast number of people. There's only one moment in the entire book, a page or two, that might be a little on the rated R side, but nothing graphic. So I would say this book is good for ages 16+. That's all for today's review, my loves. Below you'll find "Wishlist Wednesday". As I stated above, I was so anxious to get this review posted that I went ahead and bumped my "Wednesday Wishlist" 5 book post this week. I participate in this fantastic little meme hosted by Pen to Paper. Wishlist Wednesday is a book blog hop where we will post about one book per week that has been on our wishlist for some time, or just added (it's entirely up to you), that we can't wait to get off the wishlist and onto our wonderful shelves. As I said during my last Wednesday Wishlist post... Vampires and soulless women in a steam-punk England? Well, Yes please. 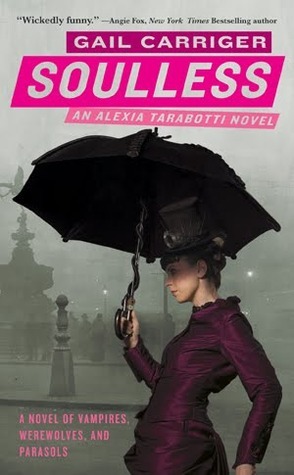 I'm especially intrigued over the 'soulless' part, and I can't wait to find out how the author plays that one out. This one seems fun, energetic, and mysterious so I'm all in. I've seen this book listed as a wish-list item, or a favorite item on a few other blogs... so I'm really hoping to get my hands on this one soon! I hope that everyone has a very happy Wednesday! Hope you get it soon. The books in this series look so awesome! I'm hoping to have two arrive in the post in the next few days. They're not my usual type of books but look like so much fun! I hope you get your hands on a copy soon! I've heard someone talking about this book before. It definitely sounds like it has a lot going on! Soulless is so good- I loved it. Yeah- read it! Gail Carriger has two series going right now, Parasol Protectorate, of which Soulless is first, and the new Finishing School series. All of them set in the same universe, all of them awesome sounding, and all of them with women standing in uncomfortable poses on the covers. (Why is that a trend in covers? Her arm looks broken, for heaven’s sake!) I’ve been waiting to get my hands on a copy but there is a waiting list at the library and I’m too cheap to buy them. Woe is me! Great review! I've had this one on my tbr pile since way before the release but haven't gotten around to reading it yet. Hopefully I can get to it early in 2013! 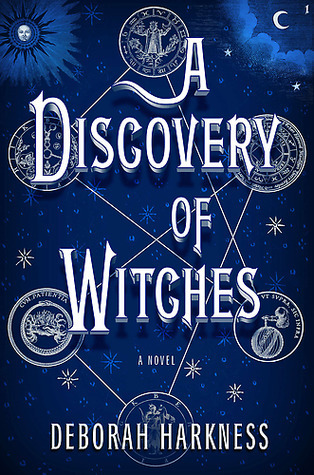 I've been wanting to read "The Discovery of Witches" for awhile now. Your review is great and now I HAVE to read it..